Confirm the origin of fire! Since this is such a silly-sounding line, the Legends of Localization reader was curious to know what the original Japanese text said. So let’s take a look! Checking to make sure the stove is off! Confirm the origin of fire! Basically, it’s saying that you’ve made sure the stove burner has been turned off. The English translation sounds wacky because it’s an overly-literal translation of the original Japanese. My guess is that it was translated by a non-native English speaker who didn’t know we don’t phrase it that way in English, similar to how ”achoo” became a martial arts sound in Final Fantasy II for the Super NES. The main tap of gas is off! But, wait! 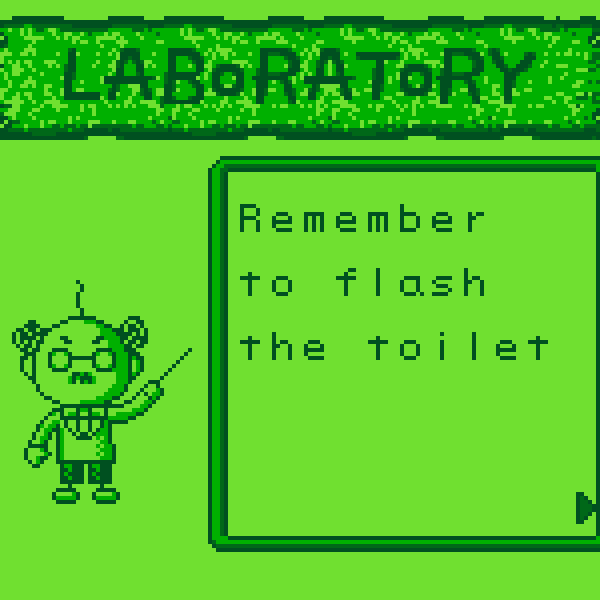 This infamous English translation actually appears again in a later Harvest Moon game for the original Game Boy! Everything’s okay!! Everything is alright!! It sounds like this “origin of fire” thing hasn’t appeared in any other Harvest Moon games, but if I’m wrong about that let me know. I remember having a fun time with the first Harvest Moon game a long ago during one summer break. I don’t remember how the rest of the translation fared, but I have heard a lot about old Natsume game translations, so if you know of any other goofy Harvest Moon lines please share them in the comments! If you liked this post and know any other fans of Harvest Moon, I hope you'll tell them about it. There's all kinds of stuff on this site that fans probably would enjoy! I don’t have anything constructive to add to this but this sounds so silly. Well, I don’t remember any strange translations, but I certainly do remember some silly typos and errors in Friends of Mineral Town. There’s typos like Sofa becoming Sopha, Dinner Rolls being Dinner Roles, and Flour as Flower. And there’s a couple instances of control codes popping up in the text along with some strange text errors, like the Copper Fishing Rod being rendered as “g Rod “hing RodCopper Fishin”. Friends of Mineral Town’s localization certainly was a thing. All those issues aside it’s still one of my favorites. In fact, I grew to like the weird random typos and strange lines in other languages. Indeed! I really like Friends of Mineral Town. It’s probably my favorite 2D Harvest Moon, really. Albeit, given the only other 2D one I played a lot of was DS… It’s really not saying a ton. After a certain point in More Friends of Mineral Town, there are a few times where the Japanese is raw and unchanged! Good thing I could read it or I’d be up the creek! You reminded me that Kemco’s mobile RPGs scramble descriptions like that. 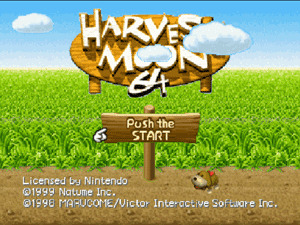 Natsume misspelled their own name in Harvest Moon 64. How does that happen? Natume is the Nihon-shiki romanization of ナツメ, so it was probably just done by someone who didn’t realize that the American company uses the Hepburn romanization. Not only that; it says “Push the START”! From what little I’ve played of Harvest Moon it seems the translations are always rushed and full of mistakes. And massive cut content in DS cute. The translation isn’t the only problem with English Harvest Moon releases, either. The US release of Harvest Moon DS is infamous for having a handful of major glitches that weren’t present in the Japanese release. Natsume quietly fixed some of the bigger ones in later printings, but couldn’t get all of them. Oh man, I still remember that I got HMDS the same day I got braces, and after I started it up and went through the kinda long intro, nobody in town showed up at all. And I had to start a new file and hope they were all there this time. Excruciating pain and game-breaking bugs, the best way to spend a day! The original Japanese release of Corobuckle Station (aka. HMDS), as I understand it, also had some pretty bad bugs… except that by “the original release” I mean “the beta-testing copy”. My research is admittedly kinda sketchy, but as I understand it, the US team actually localized one of the testing candidates and not the final version. The issues were bad enough that it pushed me to import Corobuckle Station for Girl a few months before the US release of HMDS Cute just so I could actually play a version of HMDS that wasn’t a glitchfest. Nah, you’re not missing much in DS Cute. They copy-pasted the script verbatim for when the male character in the boy version marries one of the female marriage candidate, while replacing “bride/groom” with “best friend”. I could easily see this sparkling controversy not only among people worrying about this stuff in a kid game, but also among the community that feature caters to (comedic/offensive characterization, unpolished script, only for the girls version, etc). It would anger everyone. And they wouldn’t like to kill their golden goose with a higher age rating (because of the sole presence of “Sexuality Themes”… remember they purged gambling and alcoholic beverages altogether? ), do they? The presence of alcohol in the series has actually stabilized pretty well. I believe one of the more recent games (A Tale of Two Towns) actually let you brew several kinds of your own wine and beer. Animal Parade let you cook several different kinds of cocktails, though some of them were translated a little strange (like an alcoholic beverage brewed with wheat being literally called a “wheat cocktail”). The last game in the series that I can remember censoring alcohol was Magical Melody, and that game’s nearly ten years old. In fact, more recent games actually seem to be diversifying the kinds of booze in the series, moving from the made-up cocktails and mixed drinks of old to adding in more real kinds of alcohol, like sangria and at least one kind of fermented tea-based drink. Yeah, Harvest Moon games are well known for their… errm… “quirky” translations. It’s especially annoying to the fans because Natsume is also notorious for delaying the English release of HM games, even though they STILL release with translation problems and, in some cases, really bad glitches. About the only game it seems to have really “worked” on is Animal Parade, which was delayed by several months but which has probably the best translation in the series. Almost uncharacteristically so, in fact. 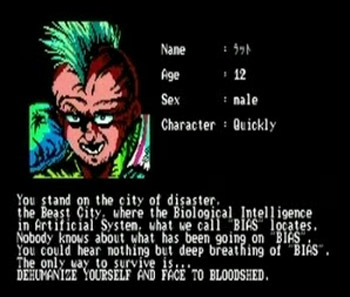 The most recent game to be released in the US has one weird line that stuck out to me, mostly because I know enough fangirl Japanese to know where it came from. 😛 As with all Havest Moon games, it has a large pool of characters you can romance, and there’s a special scene for each of them where you can confess your love to them and start officially dating. When you do this, you have the option to pick a pet name for your boyfriend/girlfriend to call you. With me so far? If you tell one character (Soseki) that you’d prefer not to have a nickname, he starts ribbing you and suggesting that he should start tacking “honey” onto the end of your name. And he seems fine with this, saying that he’s already been adding “honey” onto the end of your name for a while anyway. Of course, in the game, he never calls you [NAME]-honey, and he never will after it, either. I know enough to know that in the original Japanese, he was probably referring to the “-chan” honorific. They did make some attempt to localize it, but it ends up sounding a little odd. Incidentally, said character’s name is actually a decently clever pun in the English version. Soseki is one of the few explicitly Japanese-styled characters in the series (most are “ambiguously generic” and don’t have a defined cultural origin). In Japan, he has a different, traditional Japanese name, but he was still given a Japanese name in the English version. The reason is because he’s a writer–and there happens to be a famous Japanese author named Natsume Soseki. Natsume slipped in a sly reference to themselves that’s also a bonus for those familiar with Japanese literature. Not bad, considering how the company usually does with this poor series! HM games throughout the years have always made me think that HM is the game given to newbies in the company to get accustomed to making games or something. They’re almost always full of some very basic mistakes (be it bugs or gameplay-wise) as well as quality control issues. I’ve never really thought about that, but that does seem sort of plausible. Either that, or since it’s a “yearly” series, they kind of laze out on it a bit because they know there’ll always be next year’s edition. Maybe Animal Parade got that extra coat of polish because it was a major home console release, thus needed to look good. …Or something. The bad translations can be charming, though. A New Beginning does have some decently translated parts (like the infamous “macaroni rant”), so maybe it’s the best of both worlds with goofy lines and good lines all in one! Natsume is literally 4 people in a room. They outsource the majority of the translations and patch what they can. A New Beginning is full of translation errors. I think the description for every single one of the trees is wrong, and they translated a bunch of the “thanks for the gift” replies as if it’s always food. So you can give certain characters certain rocks or coins that they like and they’ll talk about eating them or how diamonds are their favorite food. If you need more examples, I can definitely come up with them. It’s bad. Like, people stop talking in mid-sentence without any punctuation. It’s worse than BoF2. FoMT has the pastor randomly talking in German, or Zack switching to Japanese mode. The 4:44 glitch was actually because they didn’t translate the text for that part and left it completely untranslated, and the non-Japanese version crashes if the first character in the message is a Japanese character. It’s actually an encrypted set of riddles (ten, or so) that hints about how to purify cursed items. I wonder if they included the line in the GB version as a joke, kinda like how the Spoony Bard line keeps hanging around every single FFIV remake. There are a few times in Friends of Mineral Town where dialogue boxes will just have random punctuation in them. But I think I’m so used to typos in Harvest Moon games that I barely pay them any mind. Good ol’ Natsume: the company that released the North American version of Lufia 2 with a comprehensive set of every possible bug. Nintendo did fix Lufia II when they published (and localized) it themselves in Europe. But I love them, they published a localized Chulip. I really wish they localized more stuff for other companies like that, typos be damned. They did bring lots of Japanese games during the SNES era. HM Back To Nature had an okay translation. I remembering it being very dry but not having much in the way of completely baffling phrases, except when they use “from” in place of “starting/beginning at” for things like weather. “Expect rain today from the morning” or something like that. If the wording was “from the morning on” it would sound fine to me. Good old Natsume. I know them the best from the Lufia games. While Lufia 1 has a tame and straightforward localization, Lufia II is a mess. Text bugs, graphical bugs, and even a few gameplay bugs exist. Pretty sure nobody actually testing the US version before release. One of the cutscenes takes place in a pitch black room! Besides that, the actual dialogue was well done with a few odd choices. (You little hoochies!) Pretty god SNES RPG, in fact I would say it’s up there with FFIV and VI, as well as Chrono Trigger. I thought Lufia 1 was done by Tatio? Oh yeah. Regardless, I know then for Lufia II. You must defeat the cows (you know, the most spiteful black winged and beaked species known to man) in Legend of the River King! The GBC Legend of the River King is a weird game in general. Not many fishing sims have you regularly punching wild animals to death. Ok, I am still waiting for you to do the Macalania/Macarena scene comparison in FFX. That’s all really. OH MY GOD. THANK YOU. This really baffled my 11 year old self! !!!!!!!!!!!!!! I’m so happy. I never thought I would understand that line. I’m at peace now. There’s a lot of things that seemed weird. *After you name your character, the shipper calls you “Mr. Name.” My guess is that they assumed that since “-san” is roughly equivalent to “Mr./Mrs./Ms./Miss” in English, they decided to literally translate it as such (forgetting that it can also be used on given names). *Even though the game tries to convince us that it’s in America, the Christian church references multiple gods (i.e. Shinto) and the news anchor briefly bows to the audience before giving you the weather.